Russian author; born at Jozefow, government of Lublin, Feb. 12, 1843; died at Warsaw, March 11, 1898. He was descended from a family distinguished for secular as well as Talmudic scholarship. When eighteen he went to Lublin, and some time afterward removed to Warsaw. At the latter place he became associated with the journal "Ha-Ẓefirah," to which he contributed weekly feuilletons under the name of Berosh Homiyoth; these were collected and published in one volume after his death. He contributed also articles to the Polish magazines published at Lublin, and to "Izraelita." 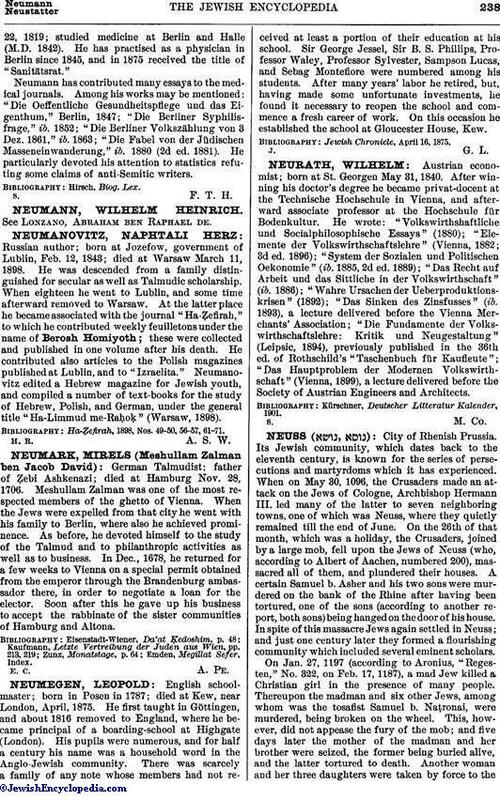 Neumanovitz edited a Hebrew magazine for Jewish youth, and compiled a number of text-books for the study of Hebrew, Polish, and German, under the general title "Ha-Limmud me-Raḥoḳ" (Warsaw, 1898). Ha-Ẓefirah, 1898, Nos. 49-50, 56-57, 61-71. H. R. A. S. W.